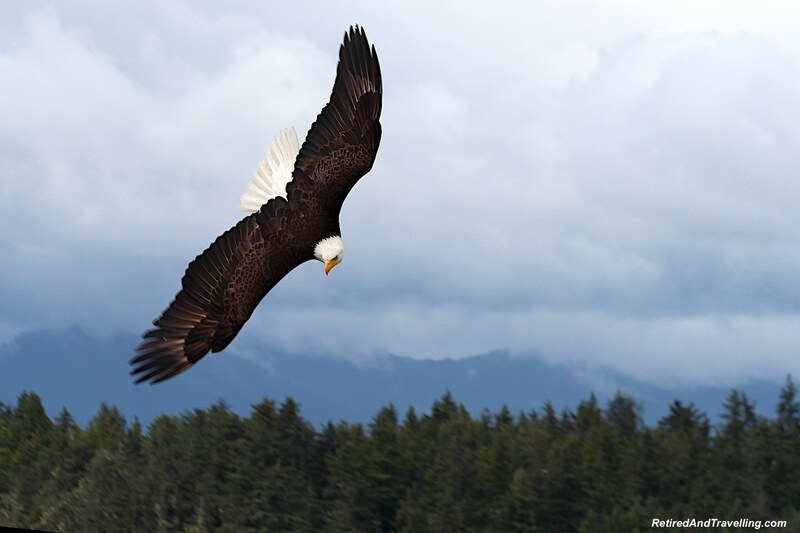 We did tours in Ketchikan and Sitka in Alaska and hoped to see wild life. 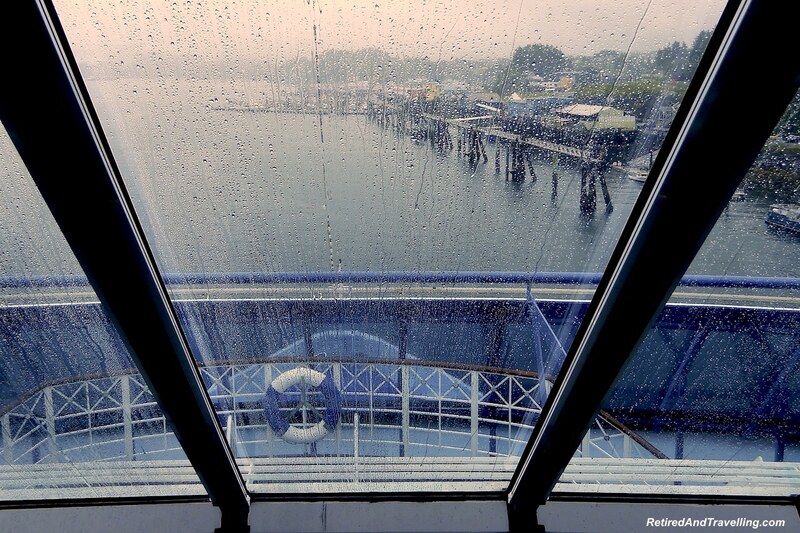 Mostly we saw rainy Alaska in the early summer. 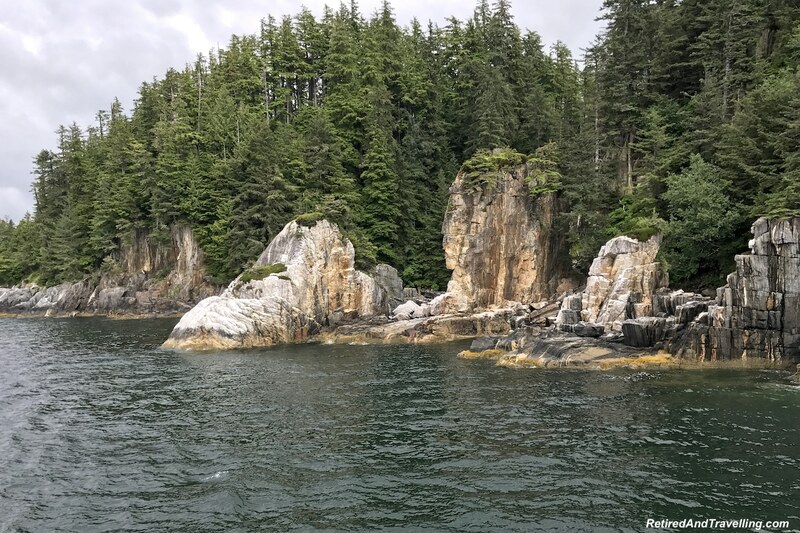 The islands and rainforests of the Alaskan Panhandle provided a great look into the natural habitat of southern Alaska. 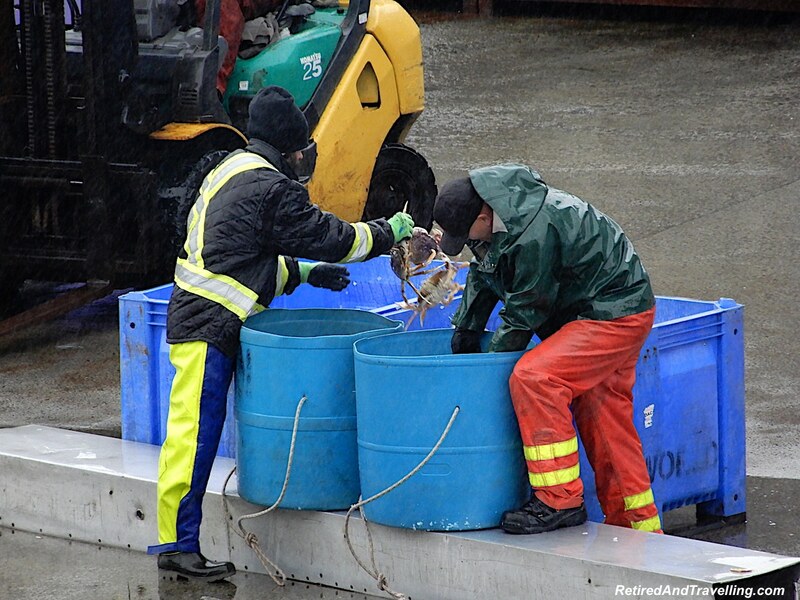 Our last port was in Prince Rupert, British Columbia, Canada. 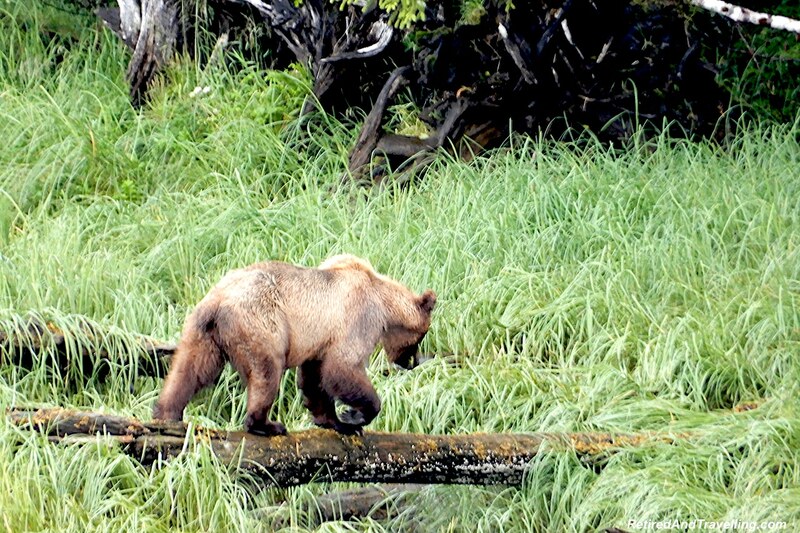 Take an Alaska cruise for grizzly bears and more! 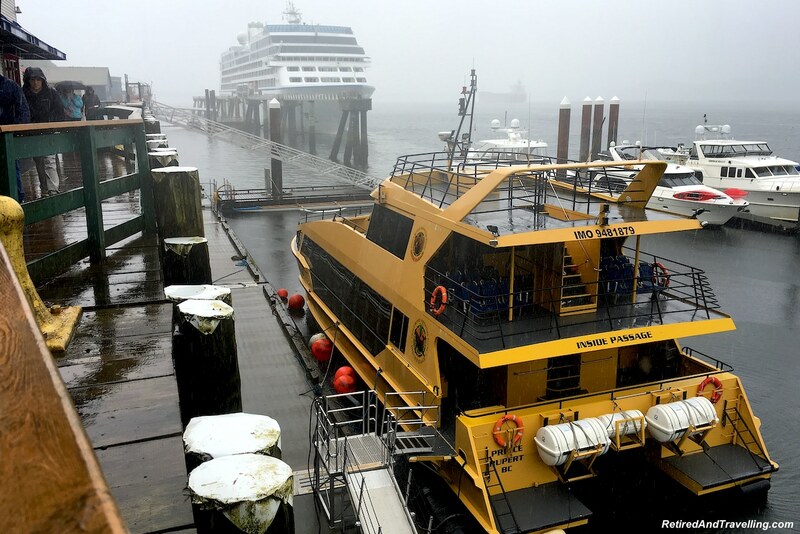 The cruise ship landed in Prince Rupert. We saw the fishing boats on our trip in. On the dock we saw evidence of a recent crab catch. 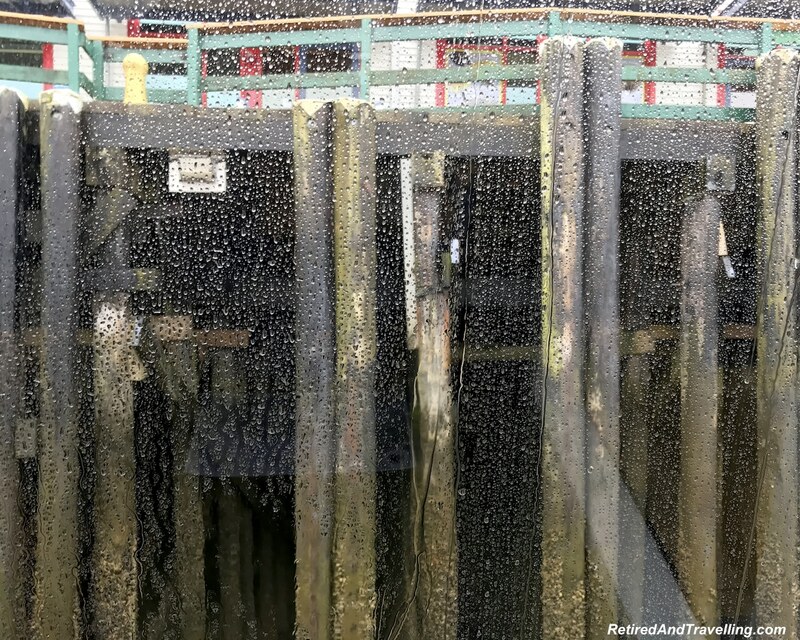 The BC Ferries ship was at the dock. 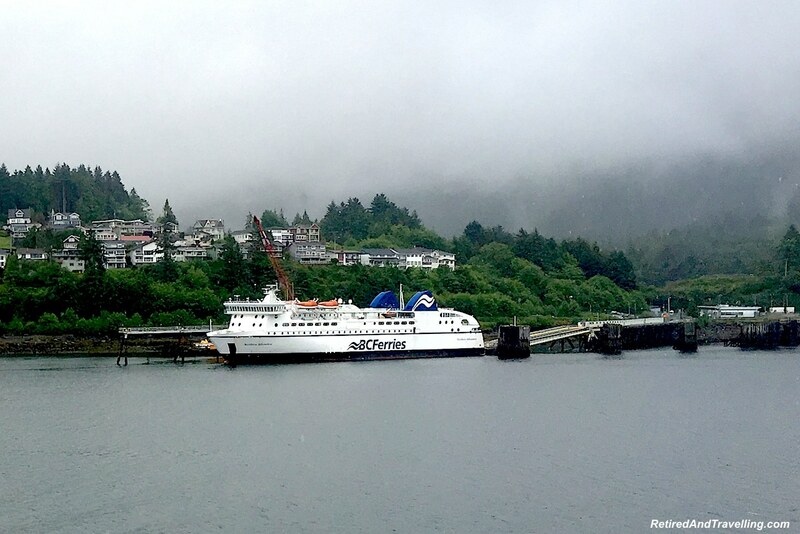 This is another good way to head north along the west coast in the summer. We were the first group off. It was a very long tour and they wanted to make sure we did not miss the ship’s sailing. It was pouring rain. 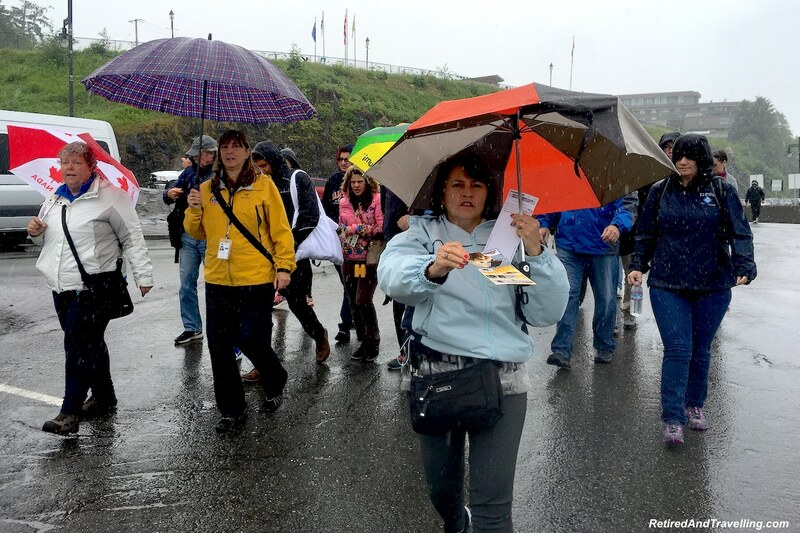 The tour leader led the group with their umbrellas across several docks. It was low tide and this meant a walk down a very steep ramp to the floating docks. 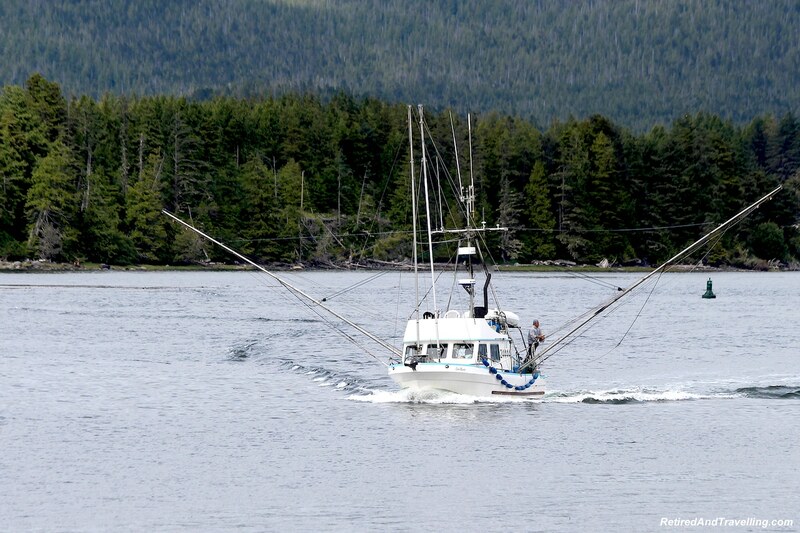 Prince Rupert Adventure Tours had great modern boats for long water trips. 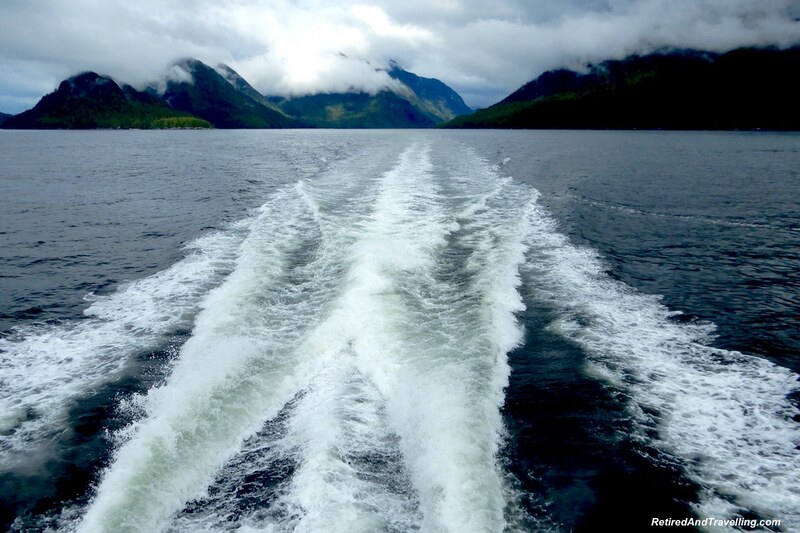 This was our chosen cruise excursion on an Alaska cruise for grizzly bears. 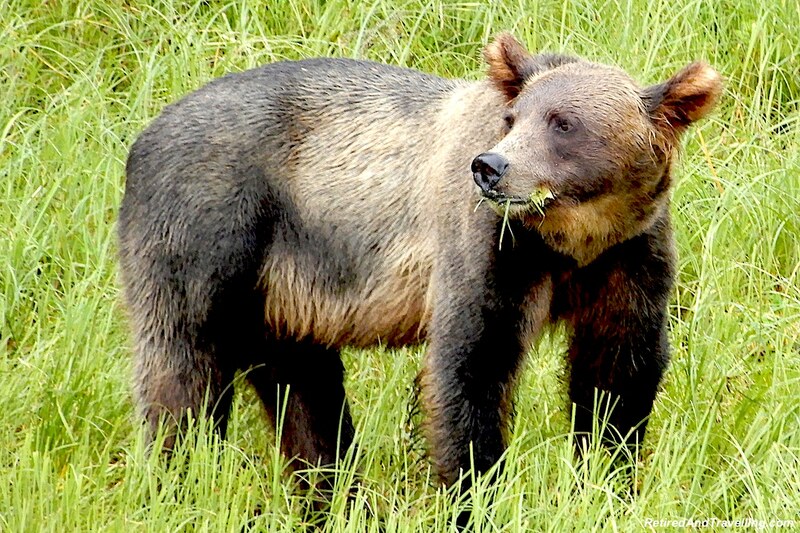 It was a 90 minute transit to and from the Khutzeymateen Valley Grizzly Bear Reserve. There were comfortable tiered seats on two levels and lots of outdoor spaces. There was even a Dyson hot air hand dryer in the two bathrooms! The captain took the trip out without any stops. He wanted us to have as much time as possible to find grizzly bears. We stopped several times on the way back. It poured rain for most of the trip out. The scenery was wrapped in mist. 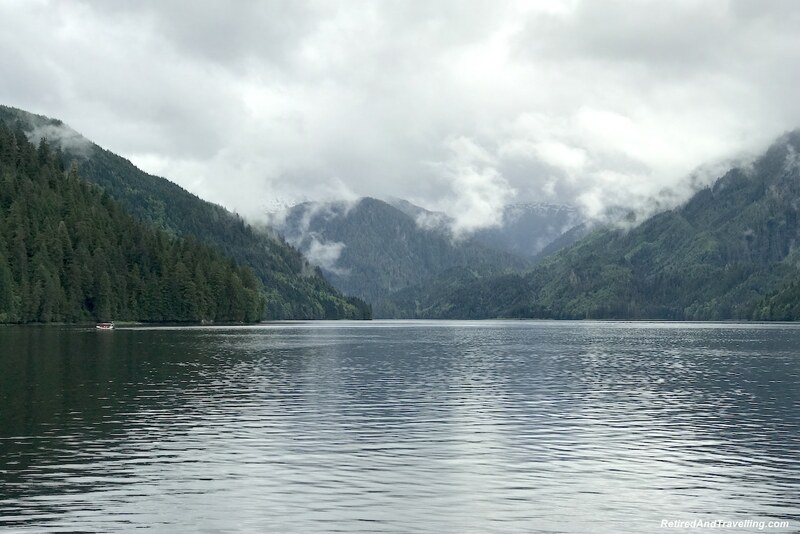 When we hit the Portland Inlet into the grizzly bear sanctuary, the boat slowed down. 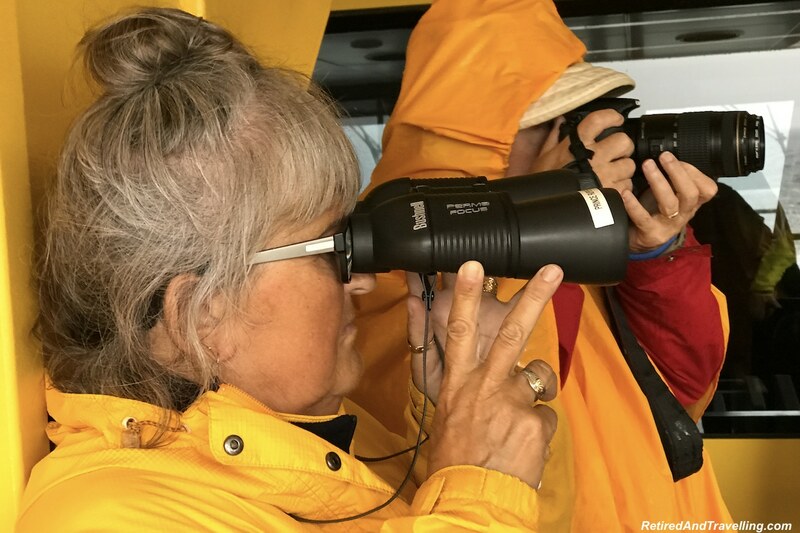 We dressed in our yellow rain ponchos and went out on deck. Everyone was on the lookout for bears on shore! We went past the Khutzeymateen Wilderness Lodge. This is the only place to stay inside the sanctuary. We later saw their pontoon boat out looking for the grizzlies. The boat slowly moved up the inlet. We cruised slowly for about 30 minutes and everyone started to relax. And then the captain sped up the boat and headed for the shore. The people with binoculars were pointing to where they saw the bear! 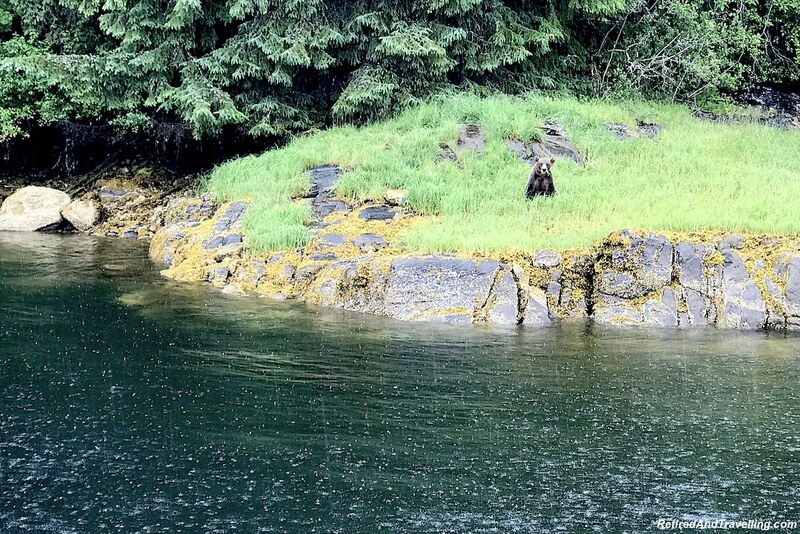 We slowly cruised along getting closer to the shore and got our first view of a grizzly bear. We stopped in this same spot on our way back down and caught yet another bear. When the bear wandered back into the woods, the captain moved the boat back into the middle of the channel. A short while later we headed to the other shore. The bears on the other shore were a light brown. This one was a large black grizzly. He wandered close to the stream and we all hoped that he would go fishing. But he didn’t! 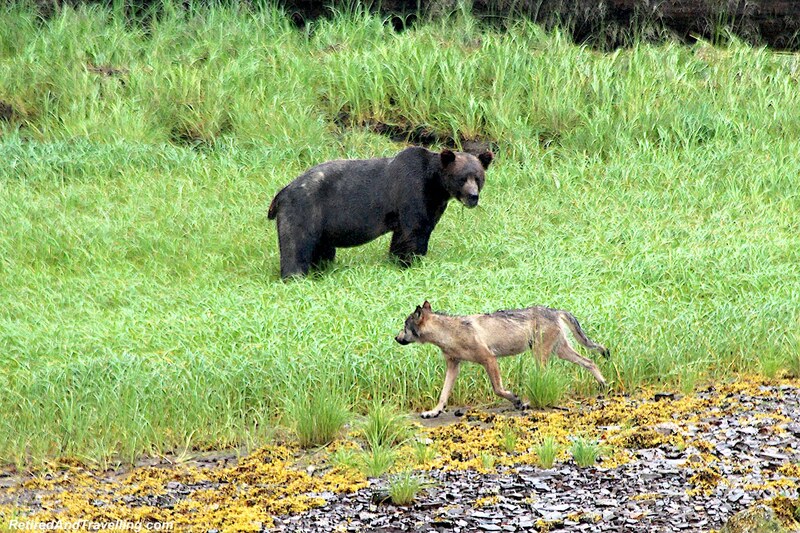 Far more exciting was when the salmon wolf wandered up to and past the bear. 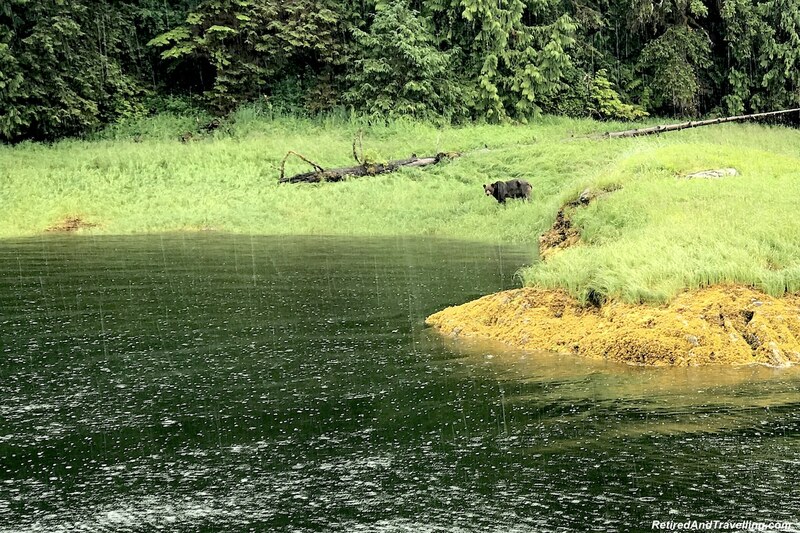 We spent a long time hovering close to this bear as he wandered along the shore. We had been warned to be absolutely quiet when on deck watching the bears. 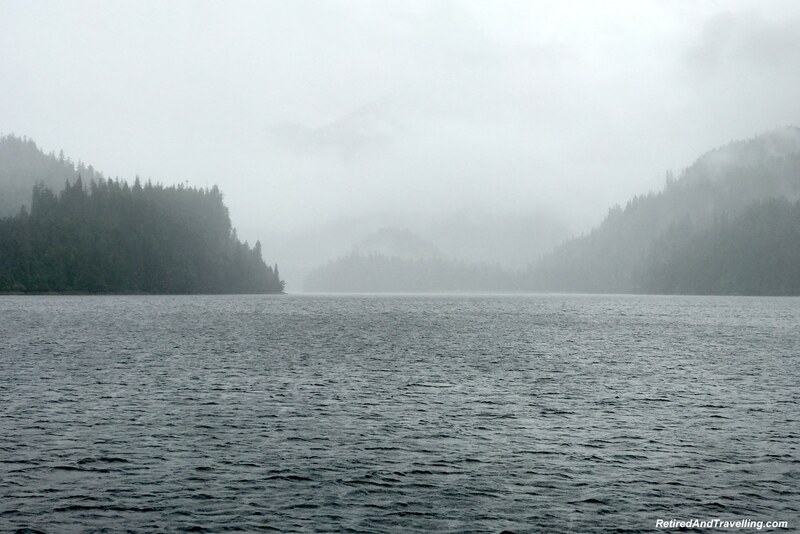 All I could hear was the sound of the rain falling on the water. 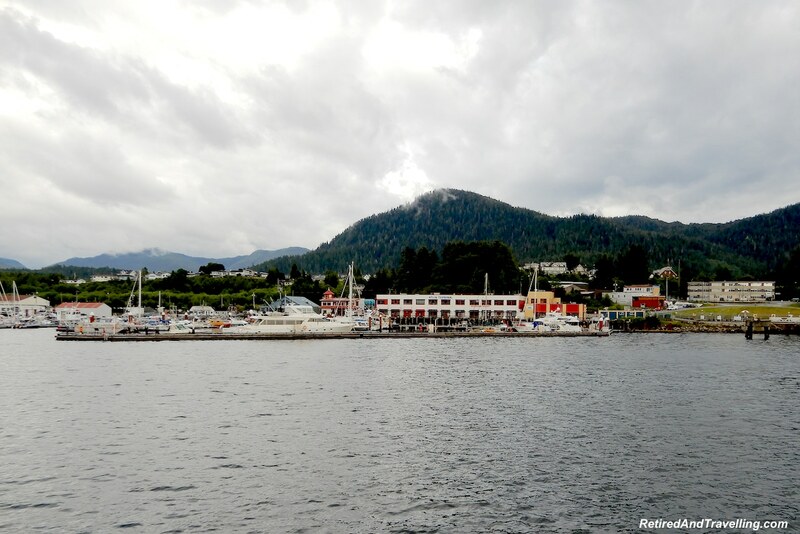 The captain moved the boat a few times when someone spotted a bear on shore. 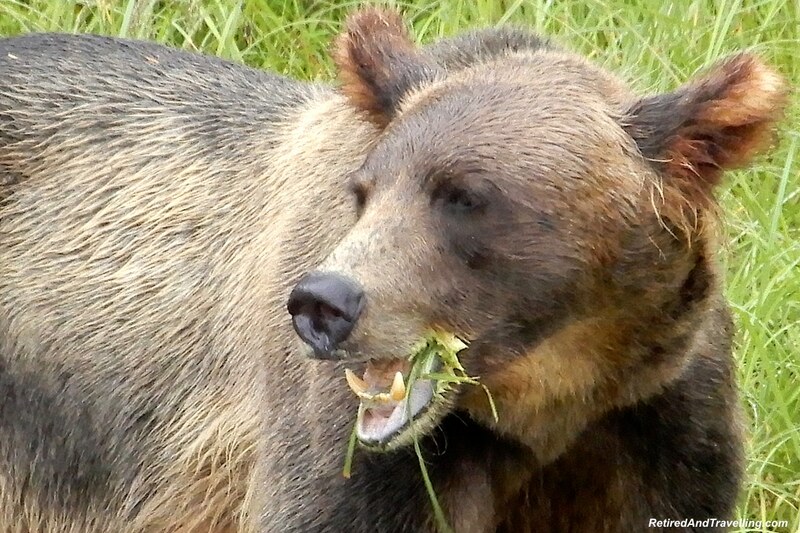 We did not catch the classic image of the bear catching salmon in his mouth. 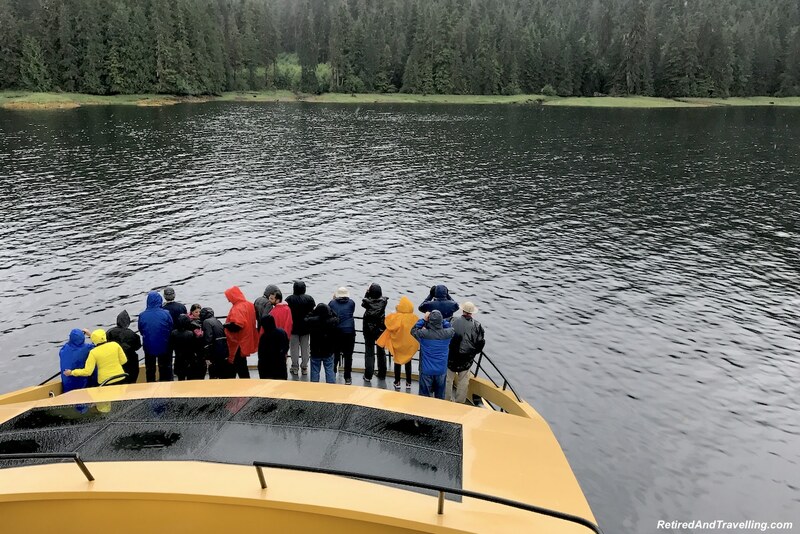 But if you are on an Alaska cruise for grizzly bears, this excursion certainly delivered great excitement. 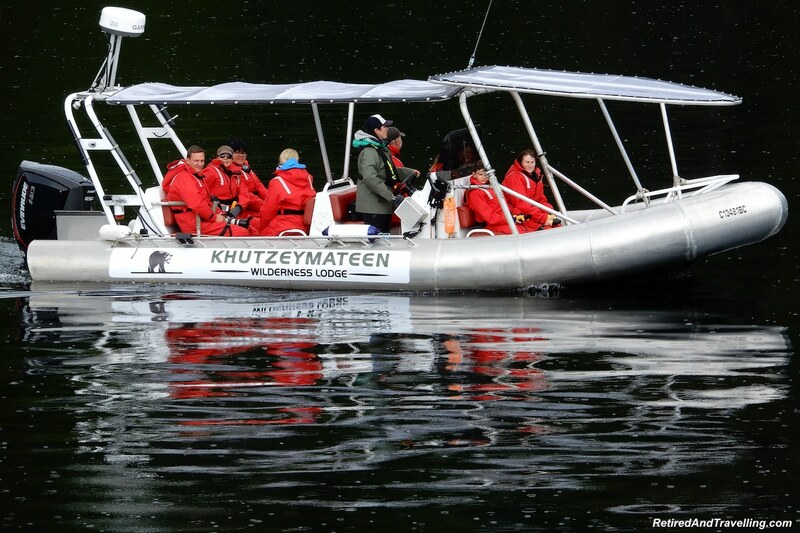 We spent over two hours cruising along the Khutzeymateen Valley Grizzly Bear Sanctuary. We were surprised how many people had lost interest and took only a quick look when we found a new bear. David and I would have hundreds of images to sort through! It had stopped raining and we got a much better view of the scenery as we drove out. After we left the Portland Inlet, the captain sped up for a little bit. He had our next stop all planned out. 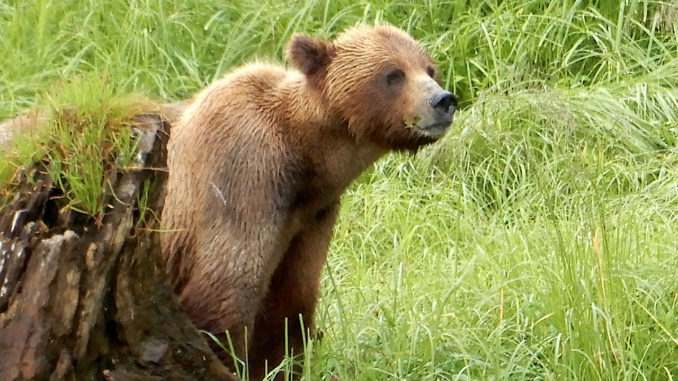 We were on an Alaska cruise for grizzly bears, but we would get so much more. 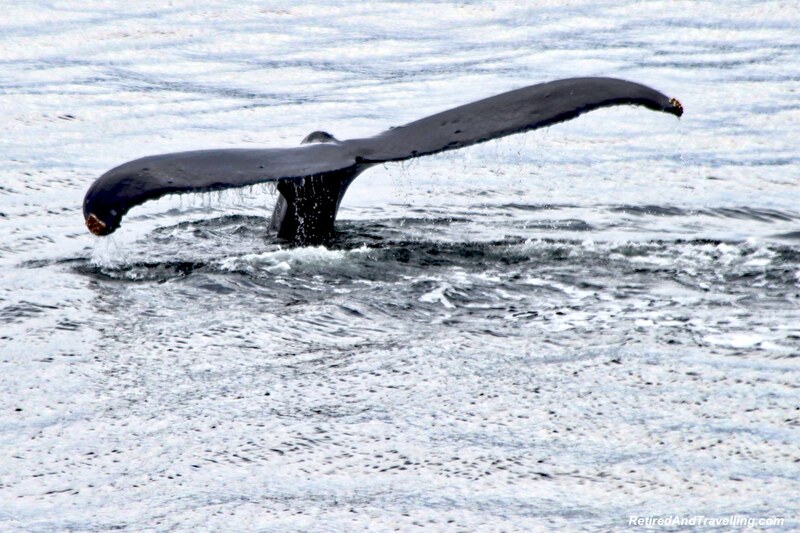 The mouth of the Work Channel was a great feeding spot for whales. 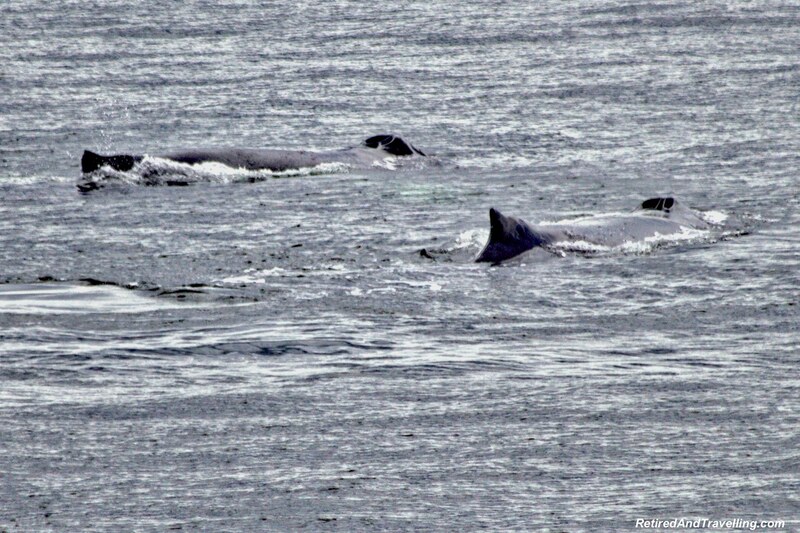 The whales sit facing into the current and just open their mouths for their catch. 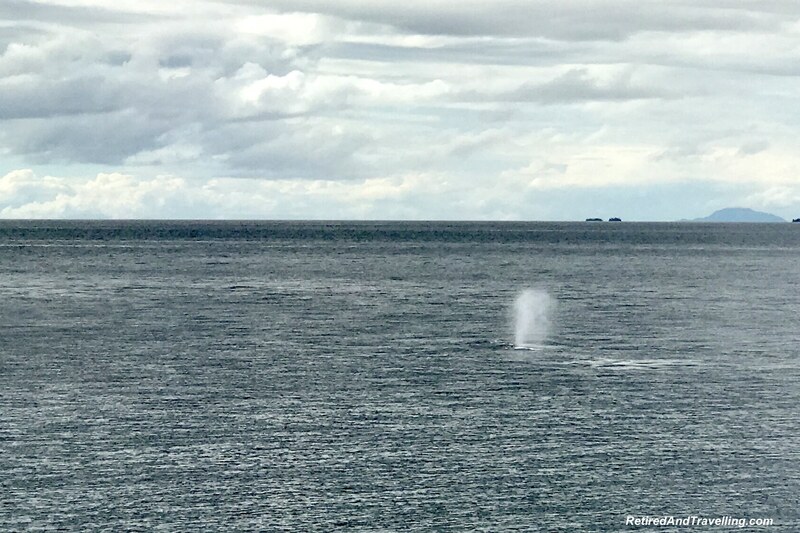 It was not long before we saw our first spout and then a second right beside it. 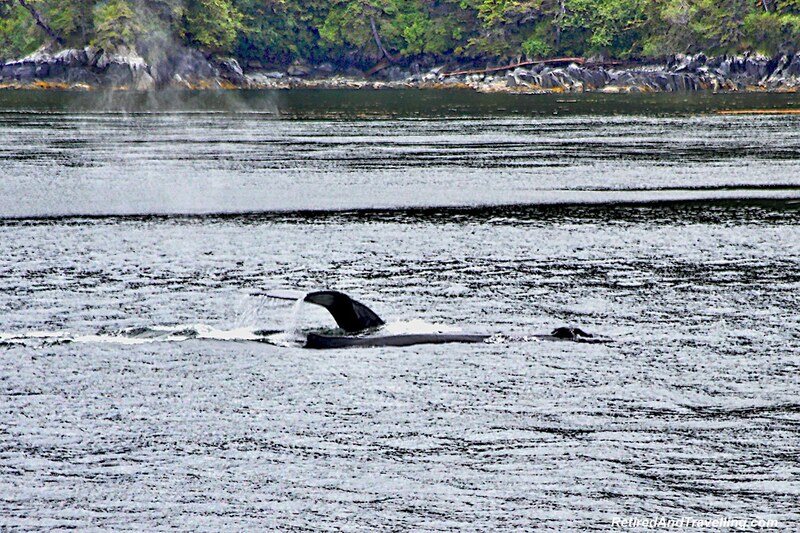 We watched the two humpback whales until they both dove waving their tails as they went. We waited for the whales to surface again. While we sat in this spot, we saw several humpback whales surface. It was a great treat after our grizzly bear encounters. 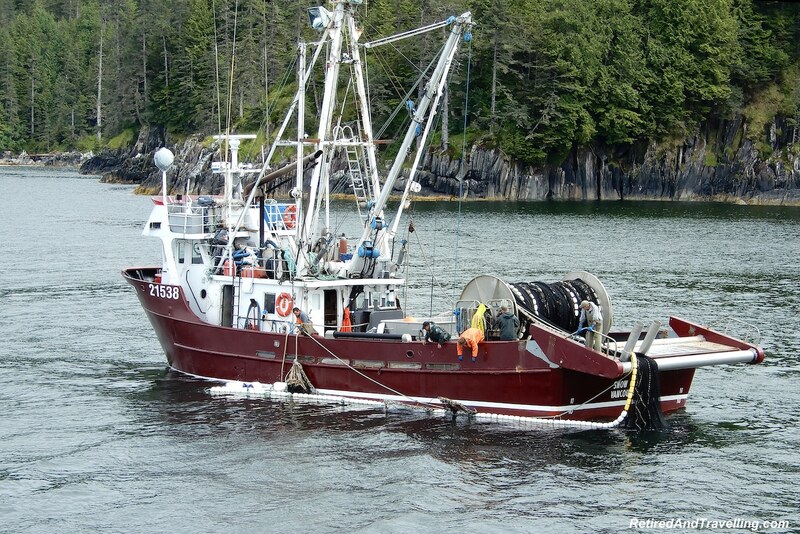 We saw a fishing boat close by pulling up the purse seine nets. 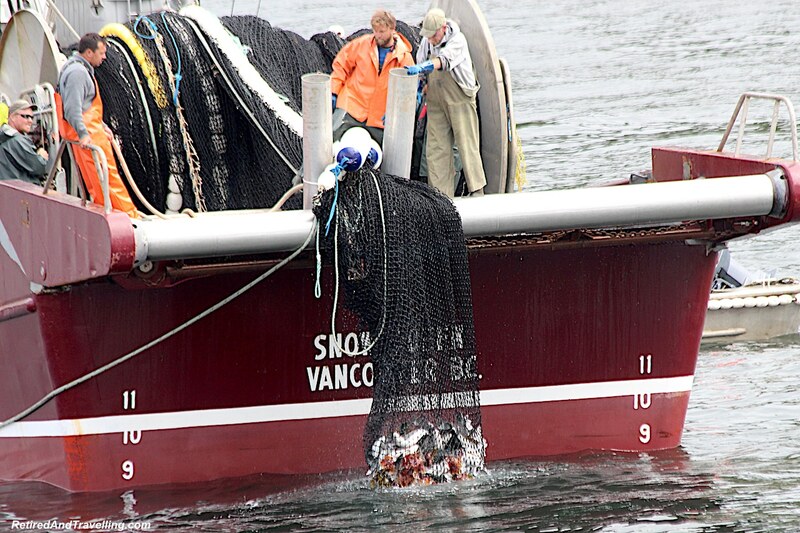 The nets came up about a third full and then they threw back in the smaller fish. The captain said he had one more treat for us but did not say what it was. 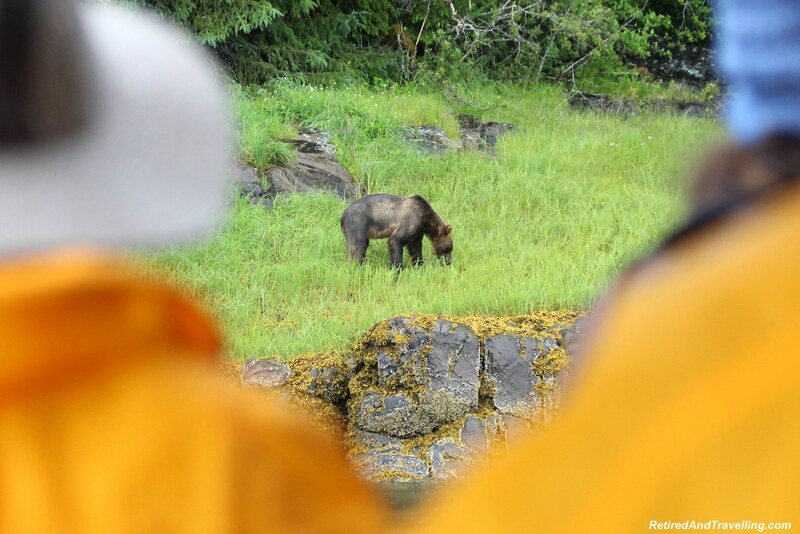 We were on an Alaska cruise for grizzly bears, but there was more excitment to come! As we left the Portland Inlet, we went around the point and slowed down. We got a great view of the interesting colours of the rocks in this area. 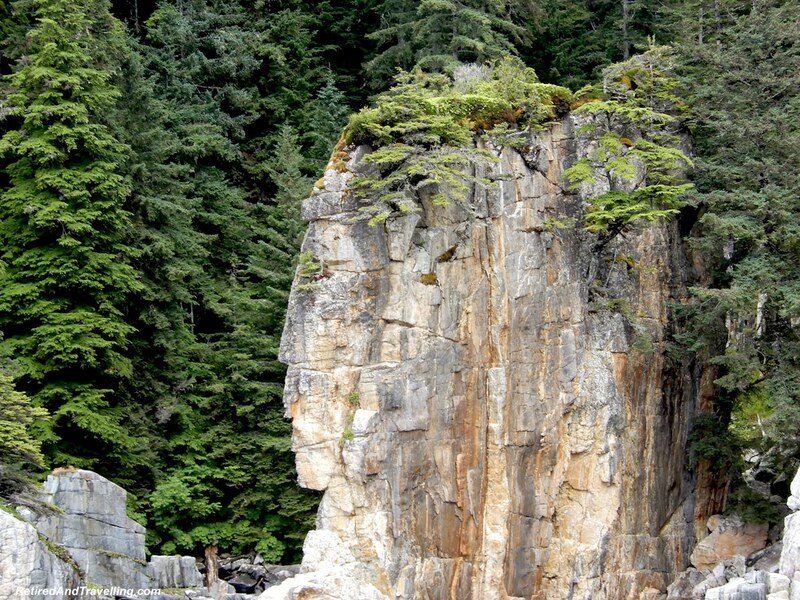 The captain pointed out the Indian head rock. 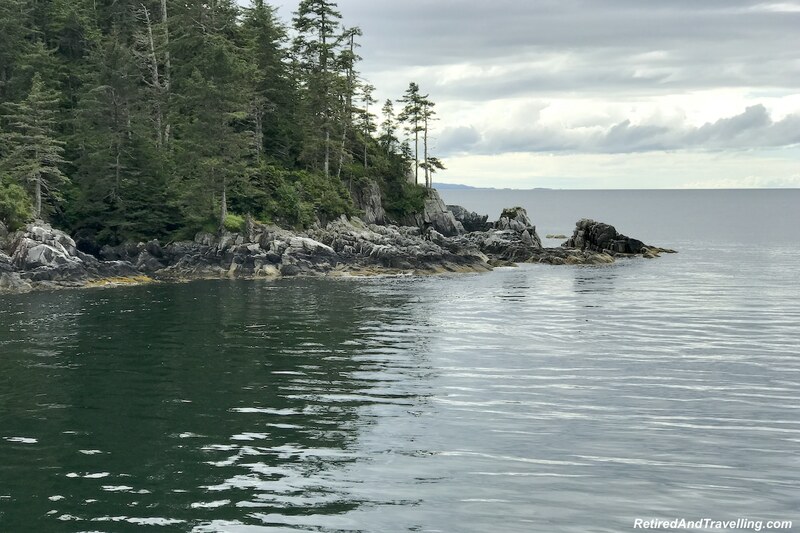 The captain cruised back at full speed until we entered the Metlakatia Passage on the final stretch back to Prince Rupert. One of the tour staff got on the microphone and informed us that she would be feeding the eagles. 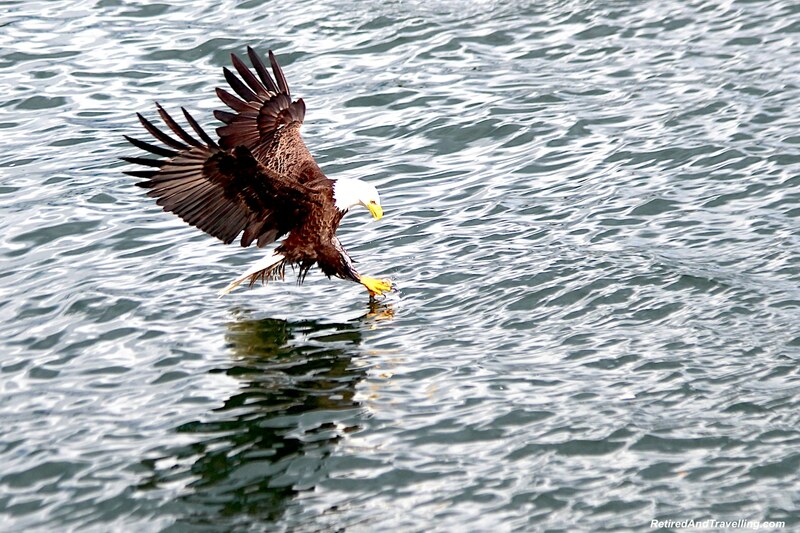 She quickly explained this was not the main source of food for the eagles but was just a high fat snack for them. 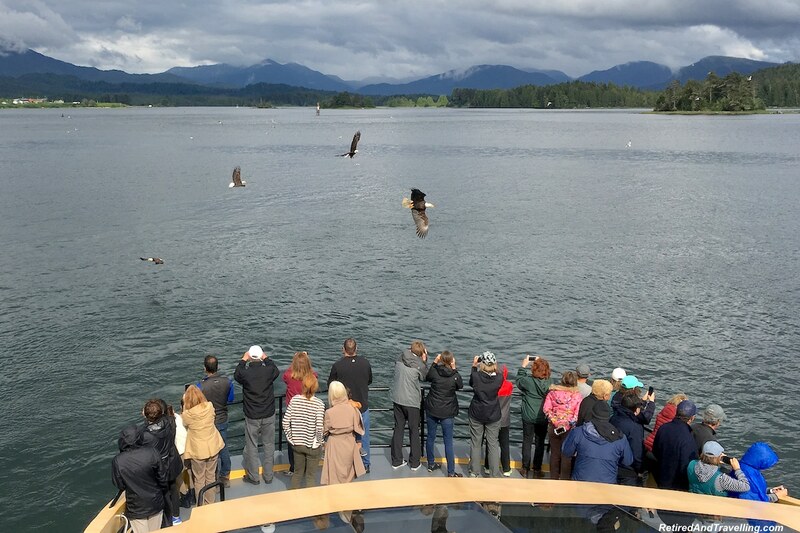 As soon as we slowed down, we started to see eagles swarming the boat. They certainly seemed to recognize that they were soon in for a treat. 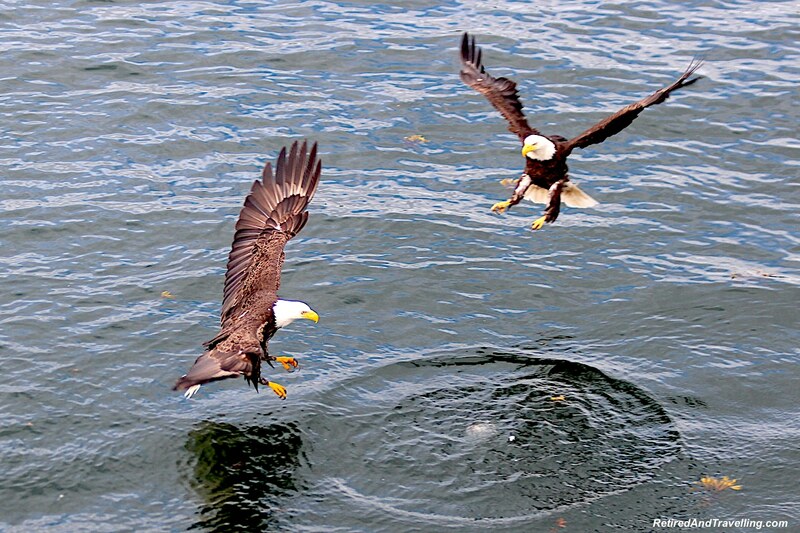 As the food sailed through the air and landed on the water, the eagles came. 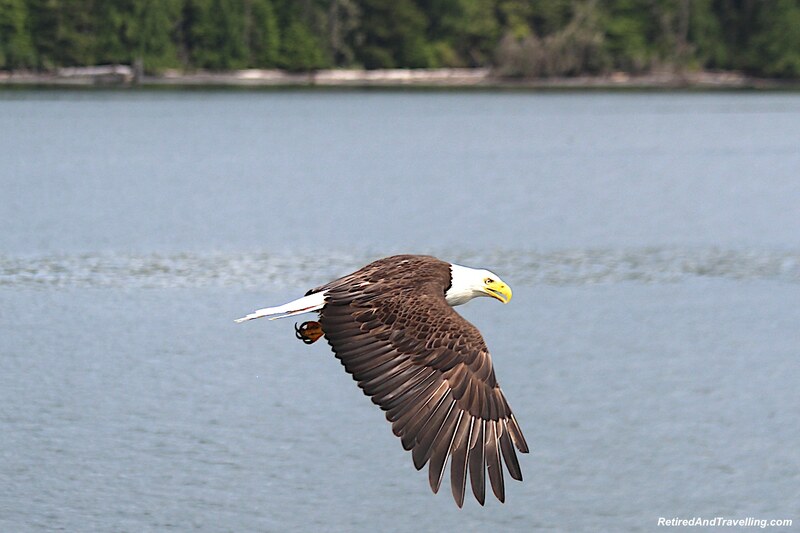 Swarms of eagles circled the boat and dived to the water to pick up their treats. It was fascinating to get to see the eagles so close by. What a perfect way to finish a day seeing grizzly bears and more on an Alaska cruise. 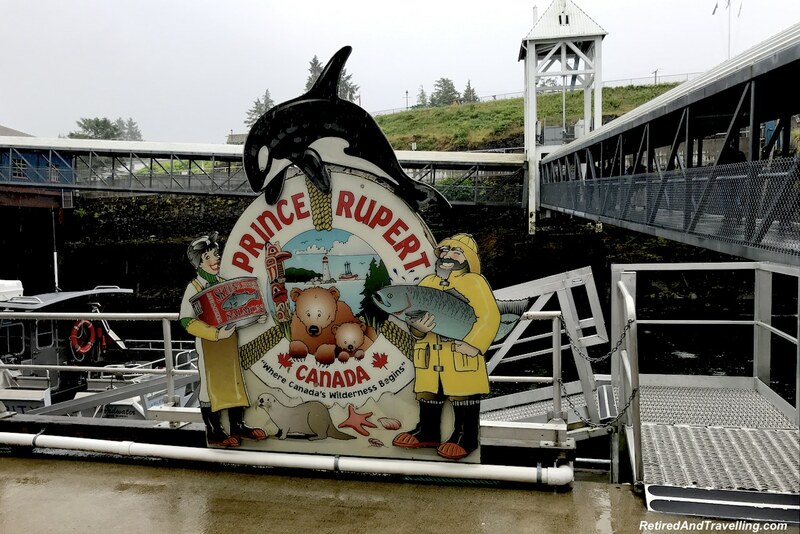 We were so happy that we booked the cruise excursion with Prince Rupert Adventure Tours. 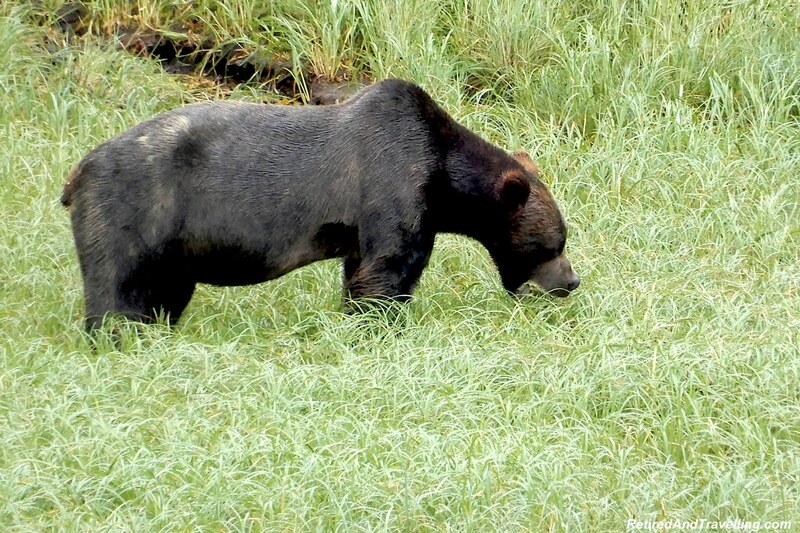 We booked this excursion on an Alaska cruise for grizzly bears. But this excursion exceeded our expectations! We started with grizzly bears. Then we saw whales. And we finished up with eagles. What could be more exciting? Sometimes you get lucky and sometimes you don’t when you go looking for wildlife on excursions. 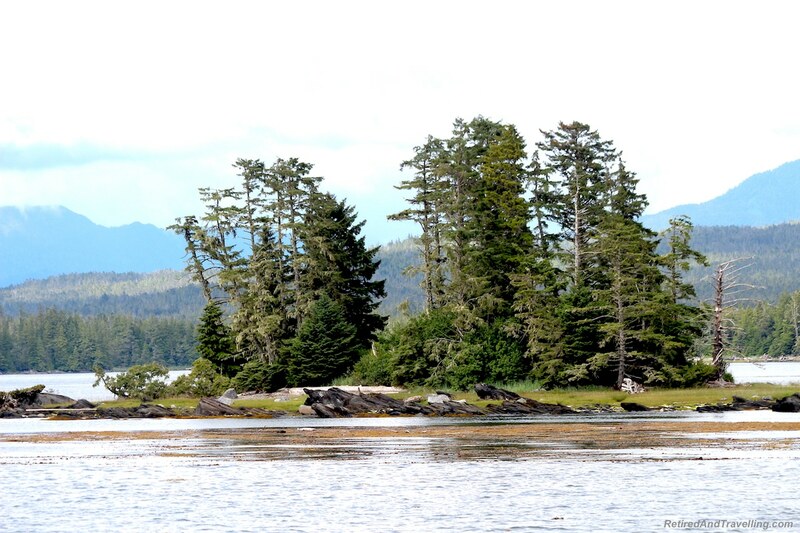 We had seen some wildlife before we reached Prince Rupert. But that final excursion left us smiling on our way back down to Seattle! 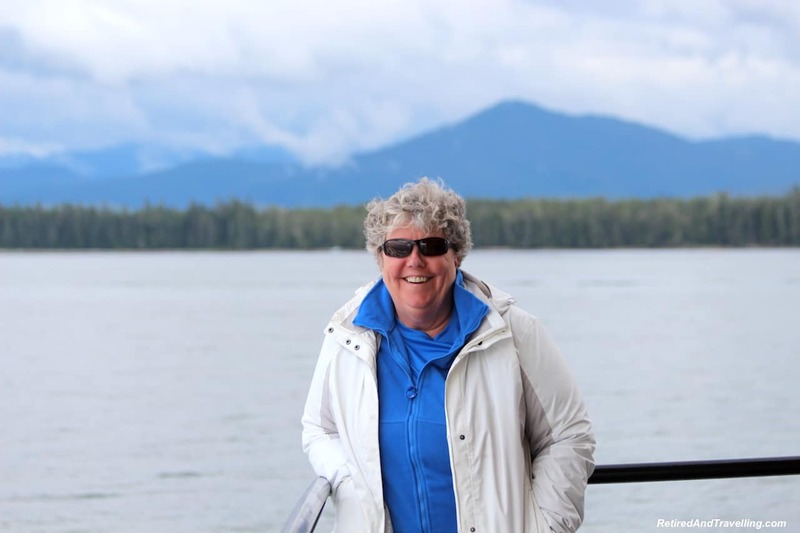 Did you go on an Alaska cruise for grizzly bears? Did you see these great animals? What was your favourite wildlife encounter? 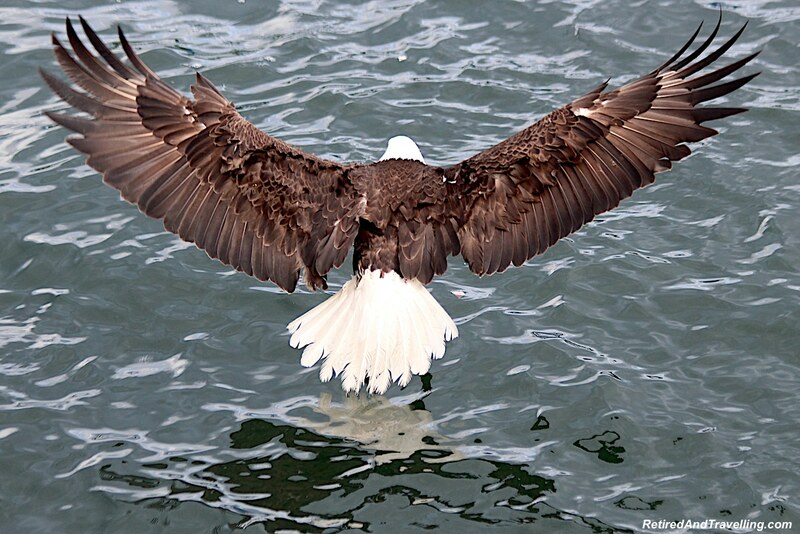 The pictures are even more stunning than usual, especially the gorgeous eagles! Really enjoy your blog for vicarious travel thrills and practical tips. thanks!